This set of three can be arranged in numbers of ways, together or separate. In fact, if you get multiple sets, you can arrange them into an infinite pattern of dishes for your little bits and bobs. 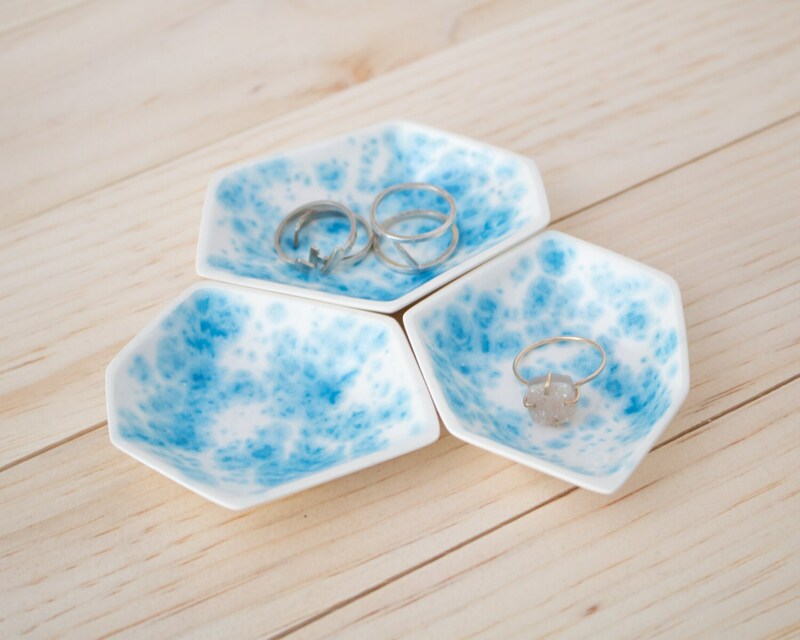 Set these small ring dishes on your dresser or side table to keep your rings, necklaces, earrings and small jewelry safe. Each dish is around 3" long, 2 3/8" wide and 1/2" tall. These delicate dishes are only 1/8" thick. This posting is for a set of three dishes, one of each shape as seen in the photos. Not safe for use with food. Large Geometric Ring Dish set of 3 in Enamel. Large Geometric Ring Dish set of 3 in Sprinkles. Large Geometric Ring Dish set of 3 in Ink Spots.